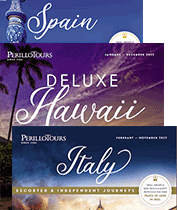 When will I receive my tour documents from Perillo? What are the airline restrictions on bottles and containers? Is smoking allowed on the Perillo Tours buses? How many pieces of luggage can I bring with me? Can I travel with a wheelchair? Can I request certain seats on the plane? You will receive final instructions, hotel lists, e-tickets and information approximately 2-3 weeks prior to departure. The detailed daily itinerary will be given to you upon arrival by your tour guide. Series of optional tours will be available for purchase from your tour guide while on the tour - they cannot be purchased before the tour starts. You are under no obligation to take any, they are strictly optional.For an updated list of optional tours, please select your tour on our website and then click on the optional tours link. Depending on the tour, if you avail yourself of all optionals, the total cost will be about $200 to $600. Please note that on Italy tours, payment can only be made in Euros, no credit cards can be accepted. All containers for gels, liquids and aerosols must be 3-oz. or smaller and placed in a clear plastic bag. Each traveler is limited to one quart-size plastic bag which must be placed in your carry-on baggage. For a more in-depth description of these and other travel restrictions (including prescription medications), please visit www.tsa.gov. There is a no smoking policy on our buses but there are plenty of opportunities to smoke during the frequent stops. Each tour member is limited to one large suitcase and small carry-on bag due to limited space on our buses. The airlines are charging extra fees for checked luggage exceeding 60" (calculated by adding the width + height + depth). The luggage should not weigh more than 44 lbs. Carry on bag should not exceed 45 inches total and no more than 11 lbs. Yes, please advise at time of booking if you require special meals. We allow collapsible wheelchairs on our tours. We regret that we cannot provide individual assistance to a tour member for walking or getting on and off motorcoaches or other transportation vehicles. Travelers who need such assistance must be accompanied by a qualified companion. Seats are assigned by Perillo Tours as a courtesy at time of ticketing. If you have special requests, please call the airline directly after receiving your airline tickets. Please note that the airline can change your seats at any time. Tips for luggage handling, doormen, housekeepers & restaurant personnel are included; tips for tour guides, local guides and bus drivers are not. Such gratuities should be extended on a voluntary, individual basis. The SUGGESTED tip for a tour guide is $3.00-4.00 per day per person and for a bus driver and local guide is $1.00-2.00 per day. We accept checks, Visa, Mastercard, Discover & American Express. United States citizens require a government issued picture I.D., including a driver's license. United States security procedures state that all passengers 18 years and older must present official photo identification, such as a driver's license, at the airport. Your first and last name must appear on your airline ticket exactly as it appears on your documentation.